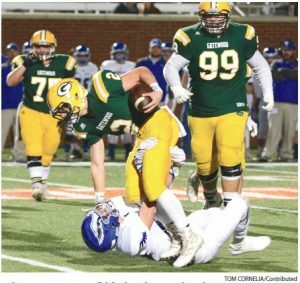 Gatewood Gators are State Champs! 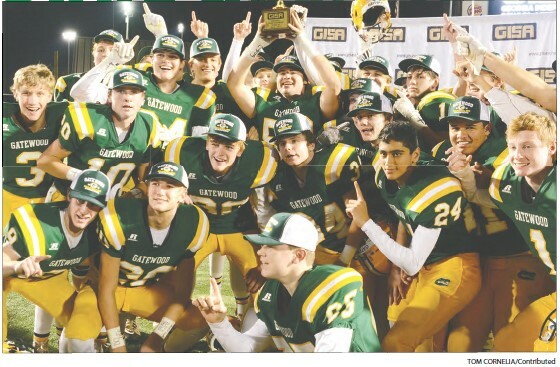 The Gatewood Gators celebrate after winning the GISA Class AA state championship – the school’s first one since 1990 – by defeating Terrell Academy. 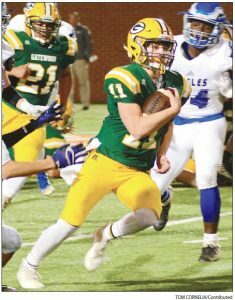 The Gators left no doubt who was the best team as they soundly defeated the Eagles in a 51-17 rout. Last Friday at Mercer University, the Gatewood Gators ended a championship drought that lasted nearly three decades as they dominated the Terrell Academy Eagles for the entirety of the GISA Class AA state title game and hoisted the gold trophy after securing the 51-17 win. 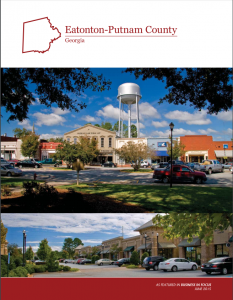 The Gators’ state championship satisfied a town-wide hunger for a title. It is Putnam County’s first football title since the Gators’ most recent championship, won in 1990. Yale Stapp powers through for a good gain. Although the Gators won the game with ease, their first drive was not representative of what was to come later in the game. After a long run by Luke Haley was called back, the Gators fumbled and gave Terrell the ball in prime scoring position. Terrell capitalized with a field goal, taking a 3-0 lead. The Gators then went on to score 51 unanswered points, putting on an explosive offensive display. After the ball got rolling with a Walt Jarrett rushing touchdown, Stapp, Haley and Preston Brown combined for four touchdowns in the first half, giving the Gators their 28-point halftime lead. Surprisingly, it was the Gators’ first lead at halftime throughout their entire postseason. Scott Haley, did the same thing. The Gators refused to take their foot off of the gas in the second half, as Haley broke away for a 28-yard touchdown on the Gators’ first play in the second half. They went on to score two more touchdowns in third quarter, giving the Gators a 51-3 lead entering the fourth quarter. Terrell scored twice late in the fourth quarter, making the final score 51-17. Walt Jarrett runs over a Terrell defender on his way to the end zone. The Gators’ offense was unstoppable all night. After their first drive, the Gators scored on every possession until the fourth quarter. The Gators surpassed their season-highs in yardage and points. The 51 offensive points should not overshadow the Gator defense’s stellar performance. The Eagles only scored 10 points on offense, with 7 of them coming late in the game when many of the starters were out and the Gators’ victory was already secure. They prevented Terrell’s talented quarterback from getting into any type of groove, and he struggled to successfully run the offense. The Gator defense swarms an Eagle ball carrier for no gain. Coach Jeff Ratliff’s Gators finally achieved their goal of winning a state title, a goal they nearly accomplished in both the 2016 and 2017 seasons. In 2016, the Gators made it all the way to Mercer, but ultimately fell short. In 2017, Gatewood lost in the Final Four to Trinity Sharpsburg. 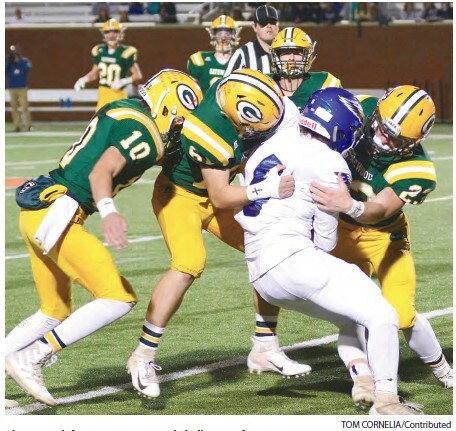 In 2018, however, the Gators left no question who was the best team in GISA Class AA. After losing their first game, the Gators went on to win 10 out of their 11 remaining games on their way to Mercer. 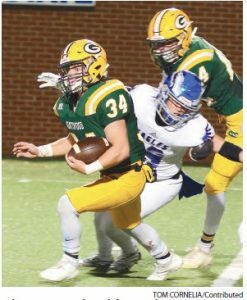 They finished the season 10-2 with a region and state championship, making them one of Gatewood’s most successful teams in its 47 seasons of football. And the best news for the Gators is they have most of their players returning for the 2019 season. That could give them a leg up on running the table again.